Yum! I want to make jam!!! I will have to try that sometime. Mom - yeah, I have actually had jam made with that. My issue is, it doesn't last as long in the fridge, and because there are only the 2 of us to eat it that can be a problem! So for now I am sticking to the low sugar sure-jell. I can see how that would be great for a big family though. Emily - do!!! It's so darn easy! Ah! Cindy! 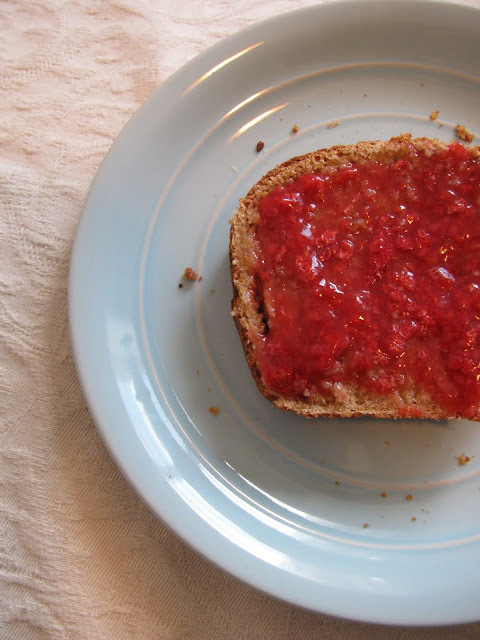 I just scrolled past that picture of the bread and jam and DROOLED! Can we pleeeease eat some more of that this summer? :) I'm so excited to see you! 3 and a half weeks! How long have you stored this dough in the fridge? could it be frozen? I have now discovered yet another beauty of your blog. My doughy hands are a-tremble!